Kluyveromyces marxianus combines the ease of genetic manipulation and fermentation with the ability to efficiently secrete high molecular weight proteins, performing eukaryotic post-translational modifications. It is able to grow efficiently in a wide range of temperatures. The secretion performances were analyzed in the host K. marxianus L3 in the range between 5°C and 40°C by means of 3 different reporter proteins, since temperature appears a key parameter for production and secretion of recombinant proteins. The recombinant strains were able to grow up to 40°C and, along the tested temperature interval (5-40°C), the specific growth rates (μ) were generally lower as compared to those of the untransformed strain. Biomass yields were slightly affected by temperature, with the highest values reached at 15°C and 30°C. The secretion of the endogenous β-fructofuranosidase, used as an internal control, was efficient in the range of the tested temperature, as evaluated by assaying the enzyme activity in the culture supernatants. The endogenous β-fructofuranosidase production was temperature dependent, with the highest yield at 30°C. The heterologous proteins HSA, GAA and Sod1p were all successfully produced and secreted between 5°C and 40°C, albeit each one presented a different optimal production temperature (15, 40, 5-30°C for HSA, GAA and Sod1p, respectively). K. marxianus L3 has been identified as a promising and flexible cell factory. In a sole host, the optimization of growth temperatures for the efficient secretion of each individual protein can be carried out over a wide range of temperatures. Kluyveromyces marxianus is one of the alternative yeasts for which an efficient transformation system was developed . It has a long history of usage in food fermentation, and holds the GRAS status (Generally Regarded As Safe) that allows straightforward food and pharmaceutical applications of this microorganism and its derivatives . K. marxianus grows on cheap lactose based media, such as whey and inulin, ferments xylose to ethanol, and does not require expensive explosion-proof plants which are necessary for methylotrophic yeasts [3, 4]. Ethanol production represents one of the pivotal field of K. marxianus utilization. In the fermentation of renewable biomass residues, its capability to simultaneously consume glucose and xylose can be exploited in order to maximize ethanol productivity . Recently, K. marxianus was also employed for tequila production at industrial level: the strain showed a higher osmotic (22% w/v) and ethanol (10% v/v) tolerance, producing high levels of volatiles . However, the intrinsic advantages of K. marxianus over other yeasts will be better utilized for a variety of biotechnological applications as more and well-defined genetic engineering tools will become available. Recently, four S. cerevisiae promoters were characterized in K. marxianus for promoter strength, time-dependent changes, and stochastic gene expression pattern . In addition, the genome of the thermotolerant K. marxianus KCTC 17555 that can convert inulin-rich plant biomass into ethanol and/or platform biochemicals was sequenced and analysed . For heterologous gene expression, K. marxianus represents a valid alternative because of its outstanding secretory capabilities [8–10]. K. marxianus can also produce eukaryotic proteins since it modifies foreign proteins according to a general eukaryotic scheme. Moreover, K. marxianus has been exploited as a cell factory to obtain valuable enzymes, showing retention of activity in a large temperature interval . A peculiar trait of this yeast is the capacity to grow within a wide interval of temperatures, ranging from 4°C to 45°C. This feature has been investigated in a study where the adaptive responses at different temperatures of psychrophilic and mesophilic yeasts were compared . The main objective of the current study was to explore the capability of K. marxianus to secrete various heterologous proteins at different temperatures. In fact, for both eukaryotic and prokaryotic hosts, it has been reported that growth temperature affects the yield of properly folded recombinant proteins [13, 14]. In E. coli a common strategy to express the target protein in a soluble state consists in evaluating different growth temperatures. Temperature lowering improves the solubility of the proteins by diminishing aggregation as a result of a decrease in the production rate, allowing the newly synthesized chain to fold properly [15, 16]. Several studies explored the effect of the growth temperature on the expression and secretion of heterologous proteins also in yeasts, albeit, in most cases, the authors investigated limited arrays of temperatures, generally ranging between 15 and 30°C [17–19]. Herein, the impact of different temperatures on endogenous and recombinant protein production and secretion was assessed in K. marxianus within a wider range of temperatures, ranging between 5 and 40°C. The reporter genes encoding the glucoamylase (GAA) from the yeast Arxula adeninivorans, the recombinant human serum albumin (HSA) , and the Kluyveromyces lactis Cu2+/Zn2+ superoxide dismutase (SOD1)  were used. To the best of our knowledge, the capability to grow both at mesophilic and psychrophilic temperatures has never been investigated for a unique eukaryotic host of recombinant proteins. Kluyveromyces marxianus can grow in a wide range of temperatures, it is still an underexploited biotechnological system, and few studies have so far explored its potential for heterologous protein production [8, 9]. In the present work, K. marxianus has been challenged as a cell factory model to investigate the impact of temperature on the secretion efficiency of endogenous and recombinant proteins. Growth rate and biomass yield are physiological features of major importance for a “cell factory” organism in order to reach high volumetric productivities of recombinant proteins. It is generally assumed that growth at temperatures below the optimal value positively affects production and secretion of recombinant proteins. In this perspective, we investigated K. marxianus L3 specific growth rates (μ) and biomass yield (g L-1) at different temperatures (5, 15, 30, 40, and 45°C; Table 1), exploiting the advantage of this heat-tolerant yeast, which optimum temperature for growth falls generally around 42°C. The strains were cultured at different temperatures in YPD medium containing 20 g L-1 glucose. The specific growth rates (μ), the biomass yield (expressed as dry weight grams per litre of culture) and the biomass volumetric productivities (QX) are reported as a function of growth temperature. The values are means of three independent experiments, with standard deviations always lower than 5%. Superscripts within a column (symbols) and within a row (letters) indicate statistically similar means, P > 0.05. As expected, the temperature markedly affected the specific growth rate (μ). The μ increased if the temperature raised, and it was highest at 45°C (0.464 h-1). This behavior was in accordance with data reported in literature indicating that all the K. marxianus strains are able to grow at 42°C, and only few strains can grow up to 48°C . Biomass yields were slightly affected by temperature, with the highest values reached at 15 and 30°C (12.8 and 12.9 g L-1, respectively). These high yields confirmed the excellent capability of K. marxianus to convert substrate into biomass . The lower values at the highest temperatures (10.6 and 9.8 g L-1 at 40 and 45°C, respectively) suggested that, even if the growth rate was high, cell reproduction at the highest temperature required a metabolic cost that affected the biomass yield. In order to assess the secretory capability of the host strain K. marxianus L3, the activity of endogenous β-fructofuranosidase (EC 3.2.1.26) was analyzed in the supernatant of cultures grown between 5 and 45°C. At all the tested temperatures, enzyme activity increased during both the growth and the stationary phases (Figure 1). The extracellular β-fructofuranosidase activity was temperature dependent, with the highest yield at 30°C (Figure 1). With the exception of 5°C, the enzyme production was abundant also at lower and higher temperatures. This result was consistent with the data reported in literature [25–27], and confirmed that K. marxianus can be regarded as a good secretor, acting as a thermally flexible cell factory able to secrete active forms of an homologous enzyme in a wide range of temperatures. Effects of the growth temperature on secretion of the β-fructofuranosidase. β-fructofuranosidase has been measured as inulinase activity at 5 - 40°C, both at the growth and stationary phases. The values are means of three independent experiments ± standard deviations. Superscripts indicate statistically similar means (P > 0.05). Letters are used to compare samples collected at the same growth phase, grown at different temperatures. Symbols are used to compare samples grown at the same temperature, collected at diverse growth phases (exponential or stationary). In a previous study the comparison of expression and secretion of recombinant proteins at different temperatures has been carried out by using different hosts . Herein, K. marxianus L3 was challenged for the secretion of three recombinant proteins in a wide range of temperatures. Specific growth rates (μ) were determined for each recombinant strain expressing the heterologous proteins HSA, GAA, or KlSod1p at 5, 15, 30, 40, and 45°C (Table 1). The recombinant strains were not able to grow at 45°C, possibly because of a low segregational stability of recombinant plasmids at the highest growth temperature, as reported in both prokaryotic and eukaryotic hosts [29, 30]. In the explored range of temperature, the μ increased by raising the temperature, with the exception of HSA that presented μ40°C < μ30°C. When heterologous proteins were expressed, generally μ were lower respect to the host (Table 1), reflecting a higher metabolic load [31, 32]. HSA was successfully produced and secreted in the range between 5 and 40°C, and the growth phase affected specific HSA production (Figure 2A). The yields, expressed as relative abundances, showed a peak at 15°C both in exponential and stationary phases. A notably secretion efficiency was observed at all tested temperatures, when compared to the highest reference value (100% at 15°C). 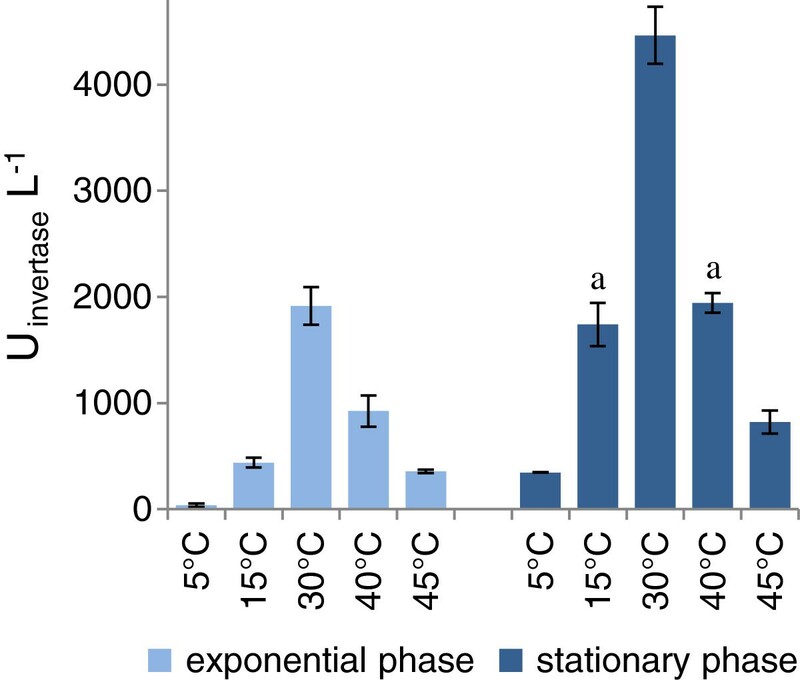 Compared to secretion levels, intracellular HSA production in both the exponential and stationary phases presented the opposite behavior, being the lowest at 15°C and the highest at 40°C (Figure 2B). Conceivably, the lower intracellular HSA at 15°C was associated to a more efficient secretion, and vice versa for the higher temperatures. A RT-PCR analysis was performed to determine transcription levels at the different temperatures (Figure 2C). At 5°C and 15°C very low amounts of HSA mRNA were observed during both exponential and stationary phases. At the higher temperatures, the relative amount of the messenger was always greater in stationary phase, and increased by rising the temperature. Although high temperatures seem not to drive the ADH4 promoter activity in S. cerevisiae or in K. lactis, we could not exclude this possibility in the K. marxianus background. This aspect will deserve further investigations. Effects of the growth temperature on HSA secretion. Culture samples, grown at 5 - 40°C, have been analyzed both at the growth and stationary phases. A) Western blot analysis of secreted rHSA; B) Western blot analysis of intracellular rHSA; C) Q-PCR analysis of rHSA mRNA. Data are reported as a function of growth phase and temperature. The values, means of three independent experiments ± standard deviations, have been normalized setting at 1 the highest value. Superscripts indicate statistically similar means (P > 0.05). Symbols are used to compare sample grown at the same temperature, collected at different growth phases (exponential or stationary). Letters are used to compare samples collected at the same growth phase, cultured at diverse temperatures. Heterologous GAA was successfully produced by K. marxianus at all the tested temperatures and the active enzyme accumulated in the medium over the time (Figure 3A). During the exponential phase production increased by rising the growth temperature up to 40°C. In the stationary phase, the total amount of active GAA secreted in the medium was similar over the range of temperatures between 5 and 30°C, whereas it was higher at 40°C. Transcript analysis showed that the relative amount of GAA mRNA had a slight variation between 5°C and 30°C in both growth phases; a significant increase was instead observed at 40°C (p < 0.05) (Figure 3B). 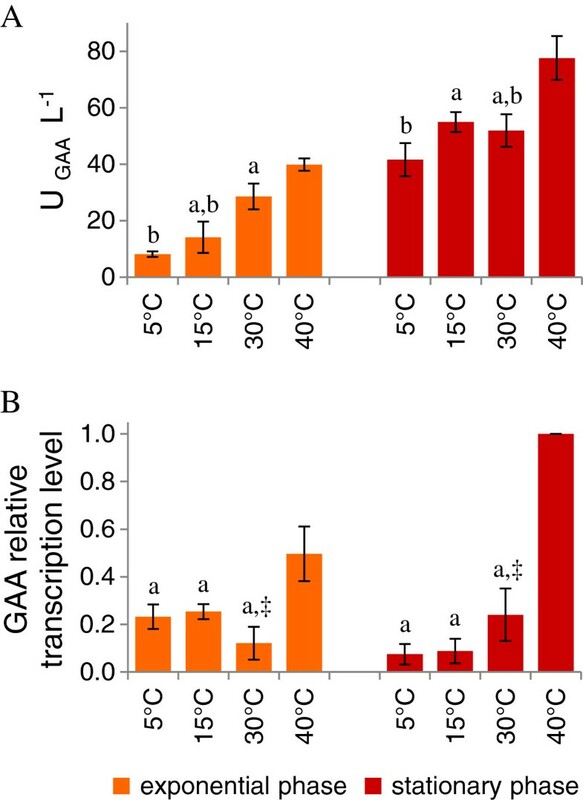 Effects of the growth temperature on GAA secretion. Culture samples, grown at 5 - 40°C, have been analyzed both at the growth and stationary phases. A) extracellular GAA activity; B) northern blot analysis of GAA mRNA. Data are means of three independent experiments ± standard deviations. The values, means of three independent experiments ± standard deviations, have been normalized setting at 1 the highest value. Superscripts indicate statistically similar means (P > 0.05). Symbols are used to compare samples grown at the same temperature, collected at different phases (exponential or stationary). Letters are used to compare samples collected at the same growth phase, cultured at different temperatures. The secretion efficiency of active Sod1p was compared at different temperatures by quantitative analysis of zymogram bands (Figure 4A). During the exponential phase, the capability to secrete active Sod1p increased by lowering the temperature. In stationary phase the production of active enzyme was similar between 5°C and 30°C and was significantly reduced at 40°C. Effects of the growth temperature on Sodp secretion. Culture samples, grown at 5 - 40°C, have been analyzed both at the growth and stationary phases. A) extracellular SOD activity measured by zymogram analysis; B) northern blot analysis of SOD1 mRNA. Data are means of three independent experiments ± standard deviations. The values, means of three independent experiments ± standard deviations, have been normalized setting at 1 the highest value. Superscripts indicate statistically similar means (P > 0.05). Symbols are used to compare sample grown at the same temperature, collected at different growth phases (exponential or stationary). Letters are used to compare samples collected in the same growth phase, cultured at different temperatures. Transcriptional analysis showed that SOD1 expression was almost not responsive to temperature up to 30°C; the level of transcript increased significantly at 40°C (Figure 4B). Actually, the genes KmSOD1 of K. marxianus and KlSOD1 of K. lactis present a 83% identity, it is then conceivable that the employed probe hybridized to both transcripts. Furthermore, endogenous Sod1p should be upregulated as a key part of a heat shock response. In S. cerevisiae oxidative stress and antioxidant enzymes play a pivotal role in heat-induced cell death and it has been observed that overexpression of catalase and superoxide dismutase genes caused increased thermotolerance . Taken together, our results support K. marxianus L3 as a thermally flexible cell factory. This strain can be adopted in a process optimized for the ‘most productive temperature’ whenever no particular constraints were placed by the produced protein. Conversely, the strain L3 can be employed at the ‘most suitable temperature’ in case of specific protein requirements (e.g. stability at low temperature). In this study, the yeast K. marxianus has proved to be a handy model system to investigate the impact of temperature on cell factory efficiency. It resulted in a thermally flexible host able to produce and secrete three different recombinant proteins between 5 and 40°C. Notably, for the first time, the impact of a wide range of temperatures on the production of diverse heterologous proteins has been explored by using a single biotechnological platform. A peculiar behavior of each recombinant protein with respect to the temperature was observed, strengthening the advantage of using K. marxianus as unique host. Because of its ability to grow between 5°C and 40°C, and efficiently secrete heterologous proteins, it can be exploited as a first-strike model system to study the temperature tuning and optimization of the production. Moreover K. marxianus meets the criteria of process safety and the demand for fast growth and high yield biomass. Kluyveromyces marxianus L3  was used as expression host. Yeast cells were grown in YPD medium (10 g l−1yeast extract, 10 g l−1 peptone, and 20 g l−1glucose). Supplement of antibiotic G418 (0.2 g l−1) was added for the maintenance of recombinant plasmids. Standard batch cultures were carried out in 500 ml baffled Erlenmeyer flasks with 50 ml YPD medium. Flasks were inoculated (10% v/v) with exponential phase cultures, grown at the same temperature, to an OD600 of 1.0, then were incubated at 5, 15, 30, 40, and 45°C for 7, 4, 3, 2 and 2 days, respectively. For each cultures, samples corresponding to the exponential growth phase and to the stationary phase were analyzed. For strains harboring the plasmids pYG-KlKlSOD1 and pGAM-GAM , heterologous protein expression was induced after 24 h of growth by the addition of ethanol to a final concentration of 2% v/v. All the experiments were performed in triplicate. Escherichia coli DH5α (φ80lacZ ΔM15, recA1, end A1, gyr A96, thi-1, hsd R17, rel A1) was used for general cloning purposes. The pGM-GAM, pYG132, and pYG-K1KlSOD1 plasmids were utilized for the expression of the reporter proteins. pGM-GAA contains the glucoamylase (GAA) gene from the yeast Arxula adeninivorans under the control of the S. cerevisiae GAPDH promoter and of the S. cerevisiae PHO5 terminator . pYG132 harbors an expression cassette for the secretion of the recombinant human serum albumin (HSA), driven by the native signal sequence, under the control of the ethanol inducible K. lactis ADH4 promoter and of the K. lactis PGK terminator . pYG-K1KlSOD1 carries the K. lactis KlSOD1 gene encoding the the Cu2+/Zn2+ superoxide dismutase fused with the K1 secretion signal, under the control of the K. lactis ADH4 promoter and PGK terminator . K. marxianus L3 was transformed by electroporation with a Biorad Gene-Pulser apparatus, as reported in Raimondi et al. .
For biomass determination, an appropriate volume of the culture was centrifuged. The pellet was washed in d.d. water and was desiccated under an infrared heat lamp. The dry weight was determined gravimetrically and the biomass yield was expressed as grams of dry weight per litre of culture broth. The specific growth rate (μ) was calculated using dry weight values in the exponential phase of the growth curve. Glucose consumption was analyzed by an HPLC equipped with refractive index detector (HPLC System, 1200 Series, Agilent Technologies, Santa Clara, CA). The analysis was performed with an Aminex HPX-87H ion exclusion column and 0.005 M H2SO4 (0.6 ml min-1) as the mobile phase. The volumetric productivities of biomass QX were calculated by dividing the biomass yield with the corresponding culture time. β-fructofuronidase was determined as inulinase activity according to Burkert et al. . Culture was centrifuged for 5 minutes at 18000 g and 1 ml of supernatant, properly diluted in acetate buffer 0.1 M at pH 5, was mixed with 9 ml of 20 g l-1 sucrose dissolved in acetate buffer. The sample was incubated at 60°C and the rate of glucose and fructose production was determined by the 3,5-dinitrosalicylic acid method . One unit of invertase is defined as the amount of enzyme catalyzing the liberation of 1 μmol of reducing sugars per minute under the conditions above mentioned. For HSA Western-blot analysis, proteins from the supernatant (10 μl of 1:10 dilution) were separated with SDS-PAGE using the buffer system of Laemmli  and 12% acrylamide gels. After electroblotting onto a polyvinylidene difluoride membrane (Biorad), target proteins were detected with specific polyclonal antibodies of rabbit. Anti-HSA primary antibodies (Sigma) were used in 1:10,000 dilution. Monoclonal anti-rabbit IgG conjugated with peroxidase (Promega) were used as secondary antibodies. Immunologically active proteins were visualized with enhanced chemiluminescence detection system (GE Healthcare), according to the manufacturer’s instructions. The densitometric analysis was performed with an image analyzer (Phoretix 1D; Non Linear Dynamics Ltd.). Total RNA of K. marxianus cells was extracted by the hot phenol method . RNA was quantified by absorbance (A260) and subjected to TURBO DNase treatment according to the manufacturer’s instructions (Ambion). Reverse transcription was performed using a Promega Reverse Transcription System with 1 μg total RNA to yield 20 μl cDNA. After cDNA generation, samples were purified, quantified with Nanodrop™ 3300 (Thermo Scientific), diluted with DEPC water (Ambion) to a final concentration of 10 ng μl-1, and 2 μl were used for SYBR Green SensiMix (Bioline). Oligonucleotides (purchased from SIGMA) were designed with Primer3 (http://frodo.wi.mit.edu/primer3/ website), considering an amplicon size of 95–220 bp and a Tm of approximately 55°C. For the HSA the primers used were 5′- GTTGCAACTCTTCGTGAAAC-3′ and 5′- AAGTAAGGATGTCTTCTGGC-3′; for the KmACT1 they were 5′- CTCCTTGCCTCATGCTATC-3′ and 5′-GAAGGAGTAACCACGTTCAG-3′. GAA activity was determined at 37°C as starch-hydrolyzing activity of the cell-free culture broths, according to Morlino et al. One unit of GAA activity was defined as the quantity of enzyme needed to decrease the absorbance at 580 nm by one absorbance unit per minute. GAA activity was expressed as volumetric activity (U l-1). SOD activity was determined by on native gel by the nitroblue tetrazolium method . During illumination with light, the gel became uniformly blue-purple except at positions containing active SOD protein. The densitometric analysis was carried out with the image analyzer Phoretix 1D (Non Linear Dynamics Ltd). Total RNA was prepared by extraction with hot acidic phenol . Northern blot analysis was performed as previously described according to Sambrook et al. . The A. adeninivorans GAA probe corresponded to the 2.1-kb Hin dIII region of the pGM-GAM plasmid. The 0.7 kb fragment of the KlKlSOD1 gene, amplified using the set of primers K1-KlSOD1_f (5′-GC AAG CTT ATG AAT ATA TTT TAC ATA TTT TTG TTT TTG CTG TCA TTC GTT CAA GGT ACC CGG GGA GTT AAT GCA GTT GCA G-3′) and KlSOD1_r (5′-GC AAG CTT TTA AGC GTT AGA GAT ACC-3′), was used to detect KlSOD1 mRNA. The probes were labeled with [α-32P]dATP by use of the Ready Prime DNA labeling system (GE Healthcare), according to the manufacturer’s instructions. All values are means of three separate experiments. Differences in means were analyzed using Student’s t test with independent measures. Differences were considered statistically significant if P < 0.05. SR, DU and MR conceived the study, participated in its design and wrote the manuscript. SR, EZ, and AA performed the experimental work and drafted the manuscript. CP has been involved in drafting the manuscript and revising it critically. All authors read and approved the final manuscript.